Balancing act: surf and yoga in Morocco - The Maghreb Times ! As someone who practises daily, a yoga holiday is my dream escape, but my other half has never been too keen. That was until we heard about Surf Maroc’s new flagship hotel, Amouage, in Taghazout, Morocco. It offers a yoga and surf package including two sessions of yoga a day (at sunrise and sunset), group surf lessons each morning, and afternoons at the beach. My boyfriend has always wanted to go surfing, so it seemed a perfect way to combine our different interests. Amouage is a 20-bedroom, oceanfront hotel set around a central courtyard, like a riad. Design is minimalist but there are splashes of Moroccan craftsmanship. When we arrive we wander through the ground floor, which flows out to the garden. Other guests are lounging by the pool or in hammocks and there’s a mix of ages, from early 20s to 50s. Most look like serious surfers but we do spot a few dedicated yogis in floaty pants and flip flops. There is a hostel-like atmosphere to the place, but it looks more like a boutique hotel. Our luxurious ocean balcony room, with white walls and elegant decor, is airy and bright. Each morning after the yoga session we drive along the coast in search of waves. I have never surfed before, nor do I particularly like being in water. My boyfriend, also a beginner, feels differently. He cannot wait to get out there – he grew up by the coast and loves being in the sea. Fortunately, our surf instructor, Youseff, is excellent. He puts me at ease and assures me that I have nothing to worry about. “Surfing is so easy,” he says. By the end of my first day I am standing up on the board, managing to catch a few small, frothy, white waves – with Youseff’s help – and feeling good. My boyfriend, more of a natural, is soon attempting to catch big, green waves. After each lesson we break for a packed lunch, which we have made each morning using food provided, before heading back into the water to practise. We stay on the beach for a few more hours before going back to the hotel for afternoon tea and a nap before yoga. The teachers offer a creative vinyasa flow spiced up with varying elements of iyengar, yin and restorative yoga. The morning classes are dynamic, with strength-based flows. Evening sessions help guests unwind after a day spent at the mercy of the waves. The setting is enough to lure my boyfriend back, although he does struggle with the stillness of the practice. My dreams of transforming him into a full-time yogi are proved somewhat ambitious. He enjoys it though, especially the beautiful setting and savasana (also called corpse pose) under the stars. Those who want more yoga can pay for private classes (£8 each) and the teachers are happy to take questions. 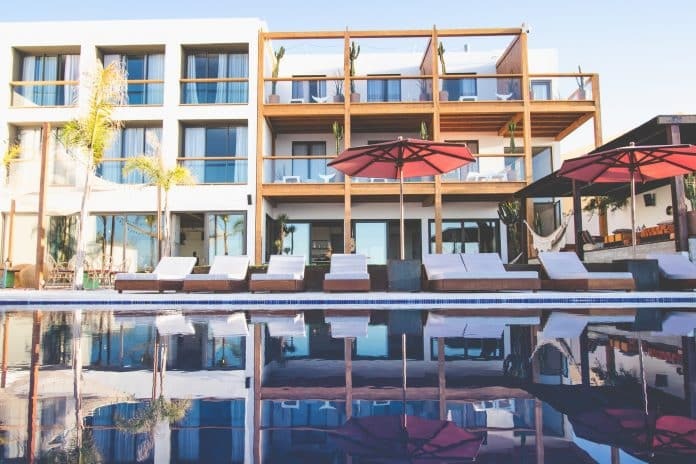 For the really dedicated yogi, Villa Mandala (one of Surf Maroc’s other three properties) offers a more yoga focused retreat, with three-and-a-half hours of classes a day. Dinner at Amouage is a time to catch up with everyone over a feast. On the table are large and tasty sharing plates of Moroccan dishes such as tagine and couscous. It’s very vegetarian-friendly. We chat to other guests, including Bilal from Chicago, a surfer who is becoming a bit of a yogi too. There’s also Ian, a consultant surgeon from the UK. And Cliff and Dan, who are on a nine-month expedition, collecting chemical samples from five continents for the Surfer Biome Project, which evaluates the effect on surfers of the bacteria they immerse themselves in. Many speak about how yoga and surfing complement each other, both involving deep concentration, flexibility and balance. By the end of the trip, my boyfriend has discovered a newfound respect for the power of breath and meditation, while I’ve conquered my fear of the sea. Sitting in a London studio the day after we get back, I do my first headstand. As I balance, legs straight up in the air, the thought of waves crashing over my head comes to mind. I topple over and fall on to the floor with a smile. Previous article2017 resolution: Get in shape in 15 min !